It looks like a melon, smells like a banana and tastes like a pear… but it’s a relative of chocolate. What is this crazy Amazonian superfruit? It’s called cupuaçu, and it’s pronounced “coo-poo-ah-soo.” You can find this fruit throughout Colombia, Bolivia and Peru, as well as Brazil, where it’s the national fruit. It grows on a medium-size tree with long green leaves and stunning yellow and pink flowers. As revealed by its scientific name, Theobroma grandiflorum, cupuaçu is a relative of cacao or chocolate. The fruit is mostly harvested when it has naturally fallen from the tree, at which point it can be broken open and used for a wide variety of applications. The creamy white pulp of the fruit can be eaten or turned into any number of tasty products including ice creams, jams, juices, candies and smoothies. 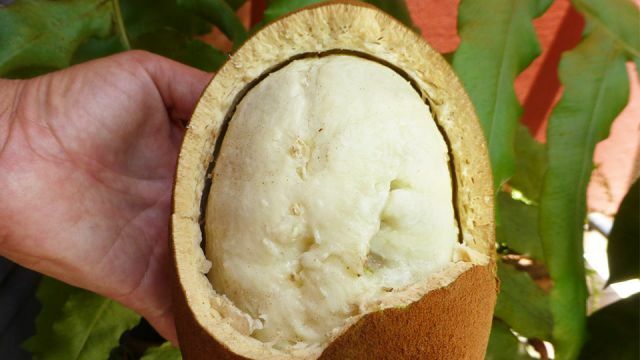 Meanwhile, the seeds of cupuaçu are rich in fats, making them perfect for the production of cupuaçu butter and oil. This can be used on its own as a moisturizer, like a softer version of shea butter, or can be blended into various cosmetics. It can even be eaten — some forward-thinking chocolatiers and confectioners are using it to make unique products similar to white chocolate, but with a sour, fruity and nutty flavor. Clearly this tropical fruit is tasty and versatile, and even more impressively, it also has many beauty-enhancing and nutritional benefits. Whether you eat it or use it on your hair or skin, you’ll find cupuaçu is an amazing addition to your holistic healthy lifestyle. Traditionally, Amazonian indigenous peoples knew about the rich health properties of cupuaçu. The seeds would be chewed to cure digestive upset and the juice would be blessed by a shaman and given for various ailments, or to give vitality to pregnant women or those wanting to conceive. It’s also said to provide a fast boost of energy (without a “crash” afterward), and boost libido. Cupuaçu makes you healthy and beautiful from the inside out, thanks to its many beneficial compounds. Antioxidants: Cupuaçu is extremely rich in several different antioxidants including Vitamin A, Vitamin C, quercetin and kaempferol. In fact, it surpasses its tropical cousin açaï, which is a well-known antioxidant frontrunner. These powerful disease-fighters are known to reduce cellular damage in the body and support recovery and anti-aging functions. Quercetin has been shown to protect skin against UV damage and decrease skin inflammation, while studies show kaempferol can ward off a number of different types of cancer. B Vitamins: Cupuaçu contains several B vitamins including B1, B2 and B3. This family of vitamins supports many bodily functions including healthy energy, hormone production and mood balance. Fatty Acids: As you’re well aware if you read our nutritional articles here at The Alternative Daily, fats are healthy! Particularly when they are whole and natural. You’ll find stearic acid, oleic acid, palmitic acid and arachidic acid in energy-rich cupuaçu seeds. These plant fats are anti-inflammatory, helping to improve circulation and heart health by balancing cholesterol levels in favor of the ‘good’ HDL. Phytonutrients: Cupuaçu contains many other beneficial compounds, including a unique group of polyphenols called theograndins. This study showed that the polyphenols found in cupuaçu help balance intestinal bacteria, support healthy blood pressure, and modulate glucose metabolism. That means cupuaçu may help fight heart disease, insulin resistance and diabetes, and obesity. Another study demonstrated the power of theograndins to kill human cancer cells. Cupuaçu also contains methylxanthines which studies show may be beneficial in warding off cardiovascular disease and neurodegenerative diseases. You can also enjoy the power of this beauty-boosting fruit by using its rich oil or butter on skin and hair. It’s no surprise that cupuaçu is a popular ingredient in cosmetic and bath products. Skin hydration: Nourishing cupuaçu oil is known to be an excellent skin moisturizer since it absorbs quickly, doesn’t feel greasy, and retains skin moisture even better than such well-loved ingredients as shea butter and lanolin. Anti-aging: Thanks to the impressive antioxidant content and soothing moisture, it’s no surprise that cupuaçu is an anti-aging superstar. When incorporated into lotions, cleansers and serums, cupuaçu improves elasticity and keeps skin firm while reducing the appearance of imperfections, thanks to compounds called phytosterols, which are shown to improve collagen production. Skin healing: By the same token, cupuaçu is very helpful for damaged skin, thanks to its nourishing vitamins and plant oils. Harness this healing power by applying to very dry areas, cracked skin, or sunburn. Hair treatment: The rich oil of cupuaçu can be used to treat dry, brittle or color-treated hair, lending hydration, shine, softness and strength. Although cupuaçu is only just becoming more easily available outside of South America, you may be able to find juice drinks made from the fragrant fruit. Some natural beauty brands are incorporating the oil or butter into their products. You can also order the oil or butter online if you prefer to make your own concoctions. Try blending up your own massage oil, nighttime moisturizing serum, or body butter. You can even make your own creamy tropical lip balm by blending four parts cupuaçu butter to three parts beeswax and three parts coconut oil. Melt together in a double boiler and pour into a small container and allow to cool. Now that you’re well-versed in the incredible benefits of this delicious and nutritious tropical fruit, you can enjoy eating it and incorporating it into your holistic self-care and beauty routine. Read more about anti-aging secrets from the Amazon rainforest in this article. Hey Buddy!, I found this information for you: "This Amazing Relative Of Chocolate Can Improve Skin, Hair And More". Here is the website link: https://www.thealternativedaily.com/19-amazing-benefits-of-cupuacu/. Thank you.